“희극지왕 심사를 담당하시는 OOO 감독님과 명예심사위원 강소라님이 계십니다. 어머………. 내 뒤편에서 소라가 일어나 웃으면서 인사를 하고잉네 Uhmuh…Behind me was Sora who stood up to say her greetings. 너무 흥분해가지고 ‘헐대박헐대박x10000000000’ 하믄서 I was so excited and ?puffing? 소라가 일어나서 여기저기 인사하는데..MC asked Sora to say a word of greeting and Sora got up to bow in various directions. 이게 진짜 버릇처럼 나옴ㅠㅠㅠㅠㅠㅠㅠㅠㅠㅠㅠㅠ 다행히 1초만에 정신차리고 멈춤…Hah,,,,here is exploded an animalistic sound…It just comes out like a habit….fortunately, I pulled myself together after one second..
뒤는 못 돌아보고 그냥 정신줄은 안드로메다 @. @ From this moment, knowing that Sora is behind me,,,I could not look back and my mind went to Andromeda..
곧 정신차리고 가방속에 가지고 있었던 갤라들의 손편지를 꺼내들고…. GV가 빨리 끝나기만을 바라고 있었음. I pulled myself together and took out letters by Sora’s Gallery fans from my bag and hoped that the GV session will end quickly. 영화가 끝이났죠~ 소라가 내려오죠~~♬ Finally, the last qustion is answered,,,the movie ended…Sora descended . 소라가 가까워지기 시작함ㄷㄷㄷㄷㄷㄷㄷㄷ I was sitting in the front row passageway and waited for Sora to come down..little by little, she came closer and closer…..
내려오던 소라가 고개를 들어 나랑 눈이 딱 마주치는 순간…. 회심의 미소를 지으면서 웃음…………..^————–^ 응??? ㅋㅋㅋSora made eye contact with me as she came down..I made a big smile and laughed. 움… 내가 호구눈으로 몇번씩이나 뒤를 돌아보면서 소라를 찾았을때..
첫번째 사진찍고나서 옆에 여자분이 ‘한번 더 찍어요! !^^’ 하니까 소라가 그분보고 웃다가 찍힌거 ㅋㅋㅋㅋㅋㅋㅋㅋAfter I took her pix, I took another of her when my seat-mate screamed for another photo from her. 그 후에 다른 일반인 부탁으로 한번더 사진찍고 출구로 ㄱㄱI took another pix of her when yet another person wanted to take her pix and then head for the exit. “(궁그미한 표정으로) 어? 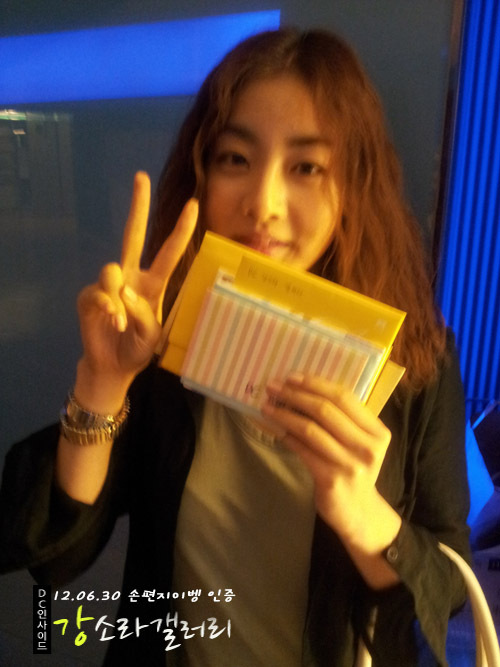 이게 뭐에요?” So, I handed to her all the fan letters from the gallery members. She asked what they are. “오~ㅇㅁㅇ 진짜요? ?” I told her that we did not know where to send fan letters so I collected them and brought them over. She said,,Oh,,,Really?? 쇼핑백에 들어있던 편지를 어케들지 고민고민하믄서..
“어우.. 근데 여기는 너무 어두운데…ㅋㅋ” But I told her that it is too dark in here, while trying to hold the shopping back with all the heavy fan mails. “(본인도 웃으면섴) 셀카 못찍는거 알면서….ㅋㅋㅋㅋㅋ” I told her that selca is better, but she tells me, You know I cannot take selca..
그리고나서 찍은 첫번째 손편지 인증샷 !!!!!!!!!!!!!!!!!!! ㅠㅠㅠㅠㅠㅠㅠㅠㅠㅠㅠㅠㅠㅠㅠㅠㅠㅠㅠㅠㅠㅠㅠㅠㅠMy hand was shaking so much…. 소라 특유의 브이손짓 나온거보솤ㅋㅋㅋㅋㅋㅋㅋㅋㅋㅋㅋㅋㅋㅋLook at Sora’s special V sign..
친구랑 이거 너무 잘나왔다고 올레! !를 외침 ㅎㅎvideo came out really pretty. My friend and I were so happy about that. 그리고 에스컬레이터 타는데까지 가다가 헤어졌음ㅇㅇThen, we walked together until the elevator and said good byes. This entry was posted in Fantaken and tagged 11th MSFF 2012, Kang Sora. Bookmark the permalink.